One of the highlights of the course was doing a placement year with a medical company, Eschmann Holdings, as Junior Software Developer. During my placement I implemented a continuous integration service using only open source software. I also developed an API (application programming interface) that connects to a US database and synchronises requirements for projects with the UK database. In addition, the augmented reality application for the training of the NHS staff I worked on was also the basis for my dissertation. I used almost everything I learned in lectures during my placement, especially programming techniques. 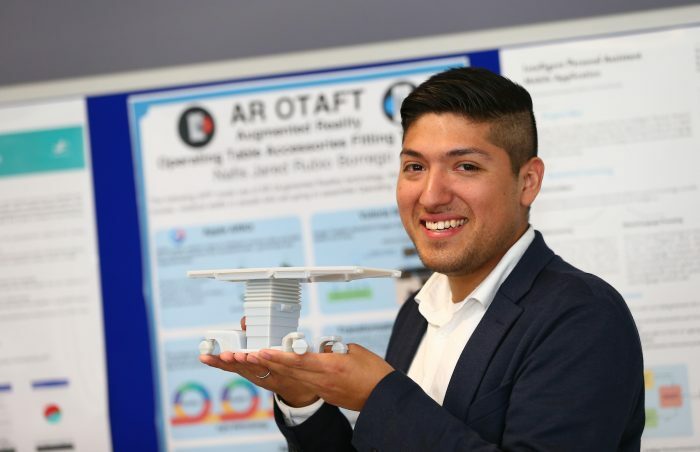 My final year project is an Augmented Reality Operating Table Accessory Fitting Trainer (AR OTAFT) which has been developed for nurses, medical staff and anyone who is going to assemble Operating Table Accessories. The APP uses an iPhone/iPad camera to display a 3D model of the selected table accessories and show the assembling. The potential of using Augmented Reality as a training tool deliver interactive, intuitive and hands-on guidance in real-time. This entry was posted in Computer science, Life at Brighton, Placements, Student Work, Undergraduate.